Plant-based eating is no longer the grassroots veganism of the ’60s. Twenty-first century vegans don’t just survive off of plain grains, beans, fruit and veggies; they now have a new “are you sure it’s vegan?” category in their diet. In other words, modern plant-based products are nearly unidentifiable as plant-based foods. I’m talking meat, seafood, dairy and egg products… but vegan. Although previous years have been chock-full of trendy vegan products, the ones taking storm in 2019 are beyond a plant-eater’s wildest dreams. Okay, so this one isn’t taking up shelves or shopping carts (unless you’re a vegan burger hoarder), but it is taking up my mind. In 2017, McDonald’s locations in Finland and Sweden began to serve a vegan burger, the McVegan, after a successful trial period. The unfortunate part of this exciting news is that the McVegan has yet to come to America. To see if this move to America would happen, I contacted McDonald’s. When asked if they planned to serve the McVegan burger in the U.S., they told me they “actually don’t have any information on that yet,” but they are documenting the questions and comments regarding this. With the success of the McVegan abroad, and the petitioning of Americans to bring it to the U.S., the soy-based burger will undoubtedly be coming across the pond. At least that’s what my vegan visions are telling me. Photo via SeaCo Foods International, Inc. Admittedly, I was a big fan of tuna salad sandwiches in my pre-vegan days. 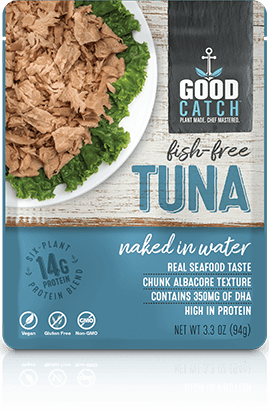 Luckily, Good Catch Foods has taken vegan-innovation to the next level and is now selling fish-free tuna. This intriguing product will likely become a popular pick for vegans in 2019. The bean-based “tuna” is ready-to-eat or perfect for making a tuna melt with your favorite vegan cheese. So it’s vegan approved and Nemo approved. I’m not clown(fish)ing around about this soon-to-be household hit. Mamma mia, vegans rejoice! We can now enjoy feta cheese on our salads (or pizzas, pasta, dips or… you get the idea). 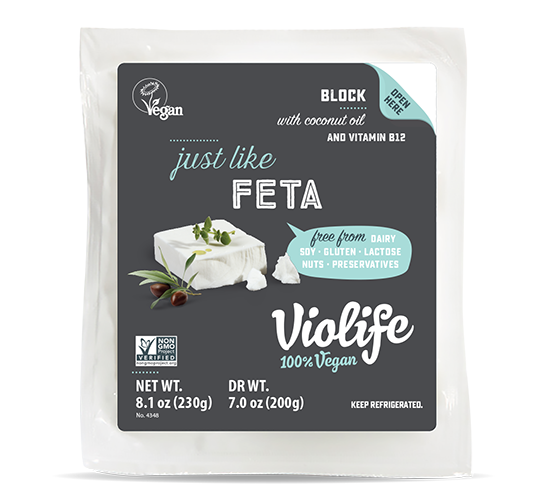 Violife’s Just Like Feta is the best new vegan cheese on the market. In my days of eating dairy, feta cheese was a personal favorite. Besides the fact that cheese has some addiction-inducing compounds, I truly had an inexplicable love for the make-it-or-break-it salad ingredient. While vegan cheeses have been all the rage for a while, Violife’s feta will be the cheese-alternative of 2019. JUST, Inc. has debuted yet another plant-based product that could leave a vegan wondering if they just ate something from an animal. The company’s new product, JUST Egg, is a mung bean-based product that cooks up just like scrambled eggs. The “eggs” can be used for a multitude of meals like a plain scramble, fried rice, omelets or French toast (oh. heck. yes.). Once cooked, the cholesterol-free egg-alternative takes on the color and texture of real eggs. Popular vegan restaurant Veggie Grill even started using JUST Egg in its breakfast burrito, so it must be the real deal. I JUST know this product will be taking households by storm in 2019. Very fond of the overall aesthetic of your blog! Although I’m not a vegan, this post definitely made it seem like the process to become one a bit easier. Looking forward to reading more about perks of veganism! Your post as a whole was so aesthetically pleasing and easy to read! I have not been the type of person to really consider vegan foods before because I grew up always loving cheese and steak; however, these foods actually look quite good! I am definitely going to consider them as soon as they hit the market! Yay, I love that!! If you’re ever looking for a great meat alternative, I recommend Trader Joe’s Beefless Ground Beef! Also a big fan of Violife’s cheddar cheese slices. I love the tone of this piece, you really engaged your audience and made it so relatable and easy to read. I appreciated how many links you incorporated into the list, and the use of the photos worked very well. I think it was a great spin on the vegan trend, because you highlighted how much veganism has evolved. There’s so many choices now, and you did a great job at presenting that in a fun and engaging way. With all the talk about how we really need to cut down our greenhouse gas emissions this is helpful and so relevant. As someone who said that I will never eat vegan products these seem not bad and I may check them out. Thank you so much! Definitely love the sentiment about helping the environment.